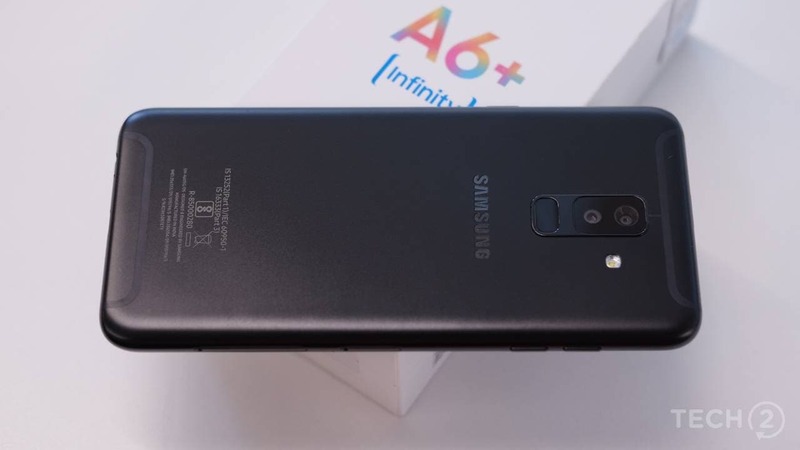 While it looks good the part with an all metal unibody design and a dual cameras at the rear, the Samsung Galaxy A6 Plus’s choice of SoC is a bit worrying. Samsung yesterday launched its new range of Galaxy J and Galaxy A series of smartphones at an event held in Mumbai. A vital part of the presentation to the media was Samsung’s findings about the how their target audience for the J series and A series devices use their smartphones. 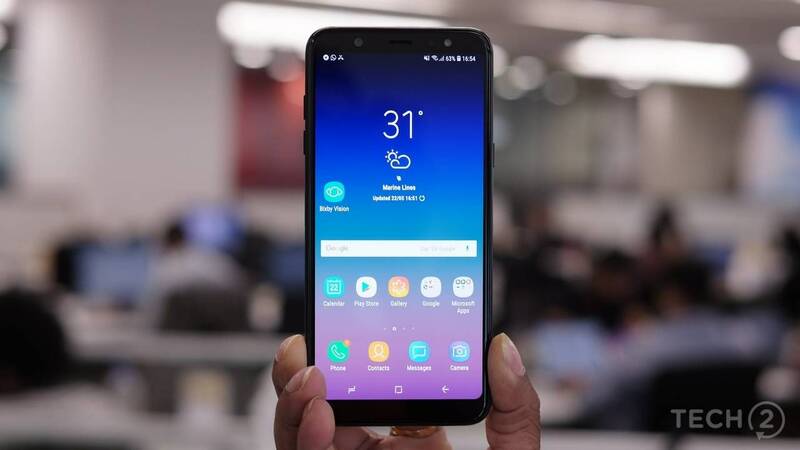 According to their findings, the display was most critical to consumer buying decisions, which is in part thanks to the increase in mobile video consumption, which is thanks to affordable 4G data pricing in India. 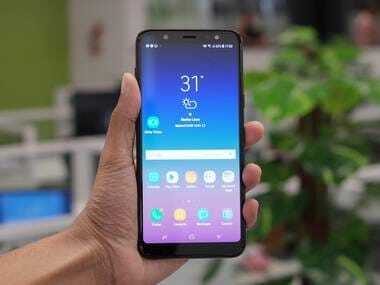 In short, Samsung’s newly launched smartphones focus solely on the display, offering Super AMOLED units on smartphones ranging from Rs 13,990 (Galaxy J6) to Rs 25,990 (Galaxy A6+). Samsung has provided us with Samsung Galaxy A6+. After using the smartphone for a few hours, here are my first impressions of the device. With the most important element of the smartphone is that Super AMOLED Infinity Display, Samsung has put in some design effort to deliver something interesting. Unfortunately, that effort was far from enough. One just need look at the gorgeous Nokia 7 Plus to appreciate how good a phone can look. The Infinity Display, does not wrap around the sides like it does on the Samsung Galaxy S9 Plus, but it does come quite close to the edges. 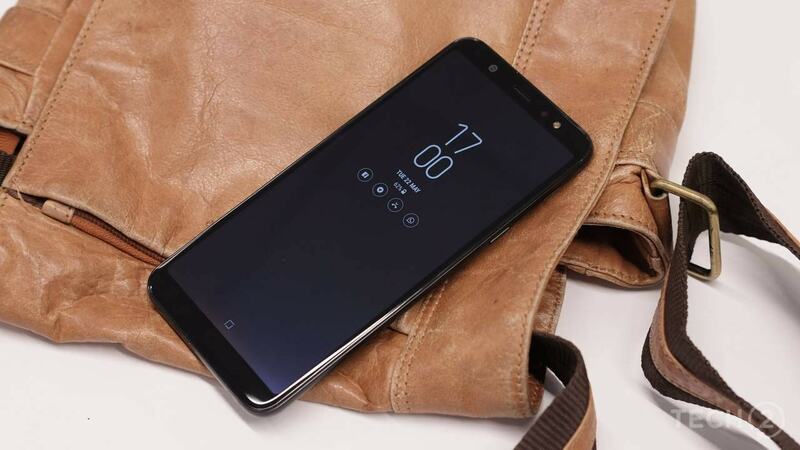 Still, by no means is this a bezel-less smartphone as there are bezels at the top and bottom of the device, though they aren’t as thick as the ones on the Xiaomi Redmi Note 5 Pro or the Nokia 7 Plus. Another accommodation for the large display means that the fingerprint reader now sits at the back, below the camera set up. The design is a bit understated and is typically Samsung, looking slightly chubby. Its also very heavy at 191 grams, but that also adds to the premium ‘hand feel’. 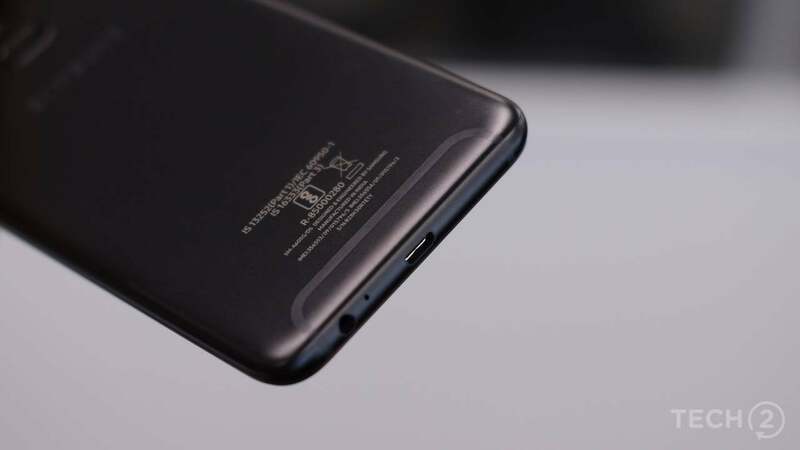 There is a curved edge glass screen on the front, although, the edges meet the rounded polished plastic around the edges which kind of adds to the premium feel. The sides are well rounded, but that also makes the metal unibody tough to grip. 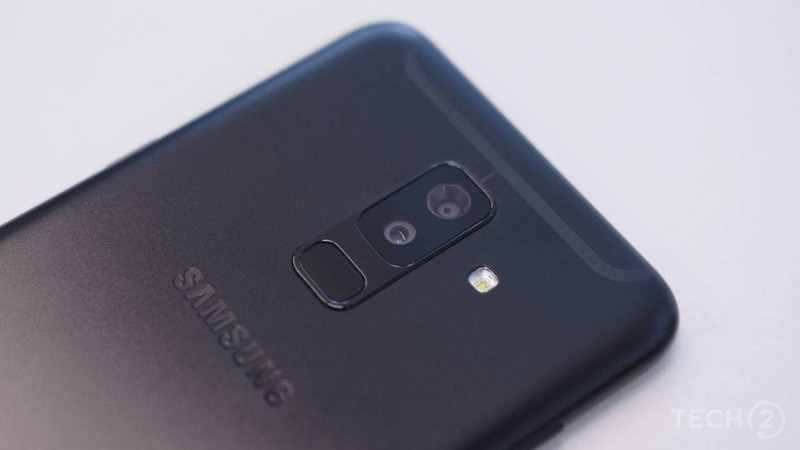 On the back, there are the U-shaped antenna bands and the new dual cameras setup, which looks very similar to the camera layout on the Galaxy S9 Plus, with a fingerprint reader below it. The bottom end features a micro USB port (which feels a bit 2017) accompanied by a 3.5 mm headphone jack, and the primary mic. What? No speaker grille? Well, it sits at the top right hand side, above the power button. Talking about buttons, the Samsung Galaxy A6 plus also features a Bixby button that still cannot be reprogrammed to do anything else. We want Assistant, Samsung, not Bixby. Indeed, the display is the highlight of the Samsung Galaxy A6 Plus. More so, because nobody in this segment offers a Super AMOLED display (forget the Infinity bit) below or even above this price range. The 6-inch Full HD+ display looks sharp and saturated as usual, and Samsung obviously takes advantage of the AMOLED capabilities by adding the Always On Display (AOD) feature. AOD keeps some pixels of the display on even when the smartphone is locked and sitting idle, giving users a better idea of the number of notifications coming from different apps, etc. We've seen this feature on several OLED phones in the past. 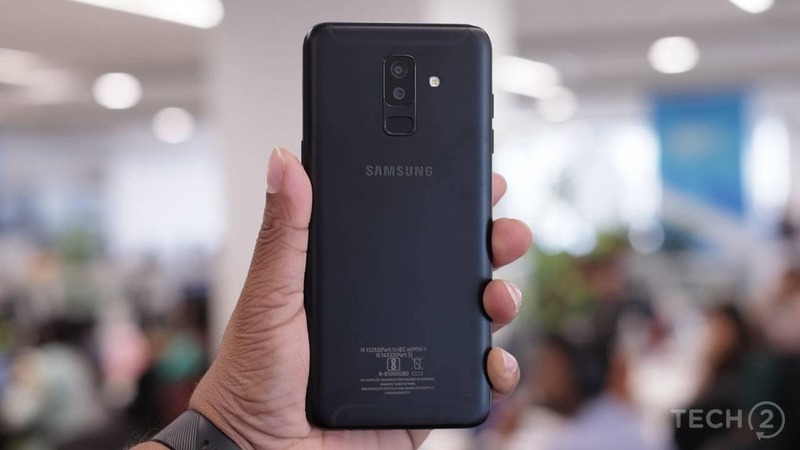 The Samsung Galaxy A6 Plus packs in a Qualcomm Snapdragon 450 SoC, which may seem a bit less when you consider that the similarly priced Nokia 7 Plus packs in a much more powerful Snapdragon 660 SoC. 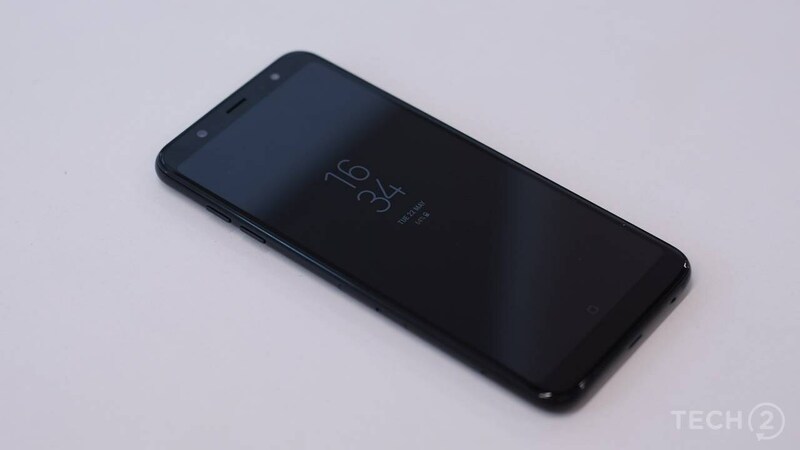 Accompanying that SoC is 4 GB RAM along with 64 GB internal storage that can be expanded up to 256 GB using a microSD card slot. About 50 GB of internal storage is available to the user, which leaves about 14 GB being reserved for system files and software. With most Android smartphone manufacturers delivering Oreo out of the box these days, Samsung too stays in the game by giving the Galaxy A6 Plus a fresh serving of Android 8.0 Oreo. 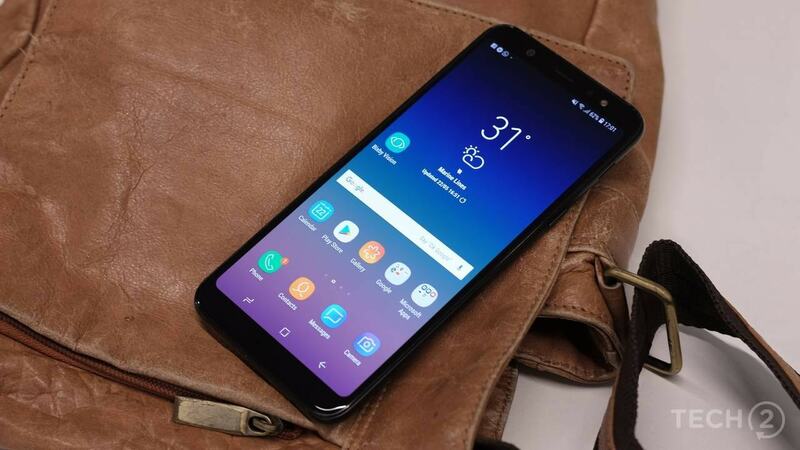 Obviously, there the Samsung Experience (or Grace UX) 9.0 that takes charge here, and it comes with the usual customization options available on recently launched smartphones from Samsung’s mid-range lineup. A neat addition here is the presences of Samsung Pay (payments), Samsung Mall (shopping) and Bixby, the company digital assistant which can be summoned at the press of the dedicated Bixby button placed on the left side of the display. The photography and video recording on the A6 Plus are taken care of by a dual camera setup on the back and single camera setup on the front. Both cameras are accompanied by an LED flash. The rear camera setup comprises of a 16 MP (f/1.7) sensor + 5 MP (f/1.9) sensor while the selfie camera comes with a 24 MP sensor (f/1.9). Dual cameras are fairly new to Samsung so it is a bold move to provide a dual camera setup in its mid-range offering. The dual camera setup helps the Galaxy A6 Plus click better portrait images (called Live Focus) and even lets you tweak the focus areas and adjust background blur after clicking the photograph. With a large 6-inch FHD+ Infinity Display on board, Samsung thankfully has included a 3,500 mAh battery to keep up with its power requirements. 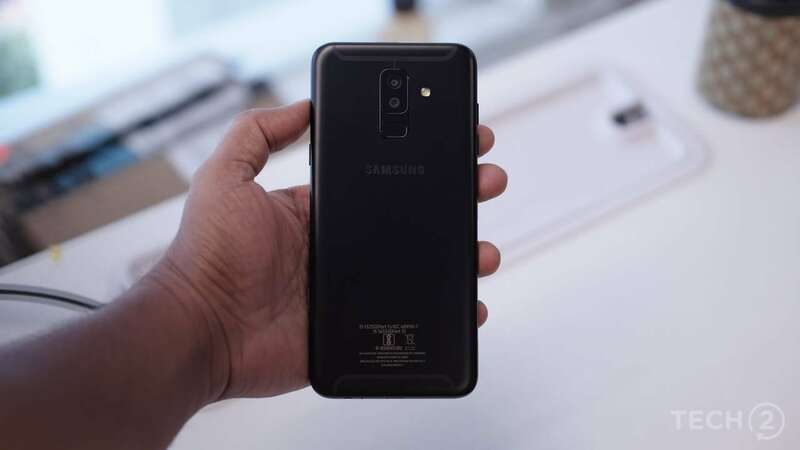 The Samsung Galaxy A6 Plus, according to its website, claims to deliver talk times of up to 21 hours on 3G WCDMA networks. The Samsung Galaxy A6 Plus seems to have it all, save for a slightly confusing price (Rs 25,990) and the Snapdragon 450. Going by past usage experience on the Xiaomi Redmi 5, the device should not face too many problems when it comes to performance. 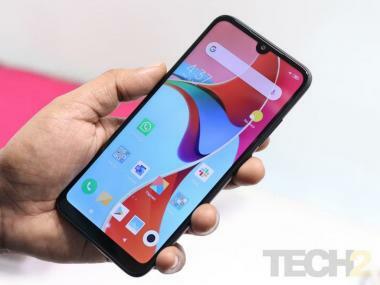 With neither the hardware nor the design going for it, everything, technically speaking, depends on that Infinity Display and the dual camera setup. I'll be sure to pay close attention to this aspect of the phone when we put the phone through its paces for a full review. Do check back in next week for more details.